Blink-182, the punk pop favorites of a generation, are back with their highly anticipated seventh studio album, California, set for release July 1, 2016 on BMG. The band premiered their brand new single, "Bored To Death," on the world famous KROQ radio station in Los Angeles this morning where they also revealed details behind their massive North American summer tour. The tour, promoted by Live Nation, will kick off on Friday, July 22 in San Diego, Cali. at the Viejas Arena and take the band to nearly 50 cities throughout the U.S. and Canada including stops in Los Angeles, Toronto, Vancouver, Las Vegas, Houston, Atlanta, Dallas, Chicago, San Francisco and more. 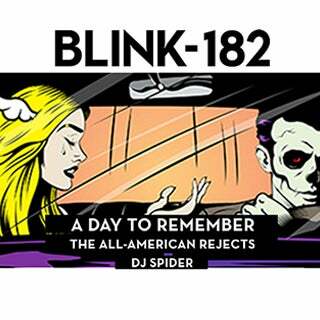 A Day To Remember will join the tour as special guests on all dates while All American Rejects and All Time Low will join on select dates. Citi card members will have access to presale tickets on select dates beginning Tuesday, May 3 at 10:00 a.m. local time through Citi’s Private Pass Program. For complete presale details visit www.citiprivatepass.com. Tickets on sale to the general public starting on Friday, May 6 at www.livenation.com.